Following a long tradition in the Valley of the Sun, the land that now encompasses the Campus Vista Historic District was platted for subdivision from agricultural lands outside the Phoenix city limits (See “Historic Residential Subdivisions and Architecture in Phoenix, 1934-1963). Although this type of suburban development flourished in the 1910s and 1920s, the onset of the Great Depression curtailed many construction projects for much of the decade. As the Depression-era economy improved in the late 1930s, Phoenix resumed its suburban growth, particularly to the north, and a number of would-be developers purchased nearby farmland for more profitable residential development. While projects were cut short by restrictions against non-essential construction during World War II, they regained momentum in the early postwar era when Phoenix’s population boomed. Neighborhoods built during this time play an important role in understanding the transition between pre-war and postwar subdivision practices. Started in the waning years of the Great Depression and built out in the early postwar era, the Campus Vista Historic District illustrates these trends to a remarkable degree. 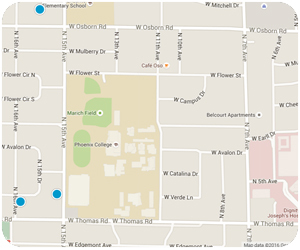 In the late 1930s, Phoenicians considered the land around W. Thomas Road and N. 15th Avenues to be “out in the country” (Phoenix College Website). That perception changed when Phoenix College relocated to a 52-acre site on the north side of W. Thomas Road in 1939. Built with $750,000 in Works Progress Administration (WPA) funds, the college attracted residents and businesses to its environs and the agricultural landscape quickly shifted to suburban neighborhoods and commercial nodes. All of these factors made the College Addition extremely attractive to home buyers in the late 1930s when the economy had finally improved and federally-insured loans made mortgages easier to obtain. Sales were brisk and the addition was built out within two years. Transitional/Early Ranch style houses filled the streets, their masonry construction and minimal ornamentation reflected the trends found in small-scale subdivision development in Phoenix on the eve of World War II (Weight 2003). Selling points for these subdivisions included their close-in locations, proximity to a major public park, and modern construction and amenities. Phoenix College, whose enrollment numbers soared with returning veterans attending school on the G. I. Bill, remained a major attraction to would-be buyers. Student figures continued to climb in the postwar era, from 2,000 in 1948 to nearly 10,000 by the late 1950s (Weight 2003). The burgeoning college population proved an ideal market for the newly opened subdivisions whose location so close to the college all but guaranteed their success. Advertisements seemed to target middle- to upper-middle class families as homes were marketed for their modern design and conveniences rather than for affordability. Owner/builder Willard Mouritsen was typical of developers who promoted the Campus Vista subdivisions. In newspaper advertisements, he appealed to “discriminating buyers” for his houses in the Campus Vista Addition. He promised quality homes in a beautiful location immediately east of Phoenix Junior College (Arizona Republic, May 11: 1947). Following pre-war traditions, more than 70 different builders contributed to the development of the Campus Vista Historic District, a fact that resulted in a variety of building types and design motifs. Notable among them are Lescher & Mahoney/Westward, Valley Construction Company, and C.F. Crittenden. Other Campus Vista builders include G.N. Richards, Ralph Haver, Frank Wallace, Willard Mouritsen, Bowers & Darrow Construction Company, C.L. Jones, and Barer & Young. The mixture of speculative ventures and custom-designed houses added to the district’s variety; about half of the houses were built on a speculative basis and about half were custom-built homes (Weight 2003). At the same time, FHA guidelines and popular preferences helped maintain a sense of cohesiveness throughout the district. FHA recommendations influenced the curvilinear street layout, large lot size (approximately 70 feet wide by 125 feet deep), standard setbacks (25-30 feet), and house sizes (approximately 1,600 square feet). Assembly-line production, standardized materials, and the overwhelming popularity of the one-story masonry Ranch style house, variations of which were built throughout the district, all contributed to convey a sense of cohesion throughout the district. Unity was further achieved by the use of similar building materials such as brick, block, asphalt shingles, casement windows, and design (Weight, 2003). Three religious complexes are present within Campus Vista, a development pattern common to residential neighborhoods. These complexes compliment the subdivisions’ residences in both scale and materials. The first, Good Shepherd Evangelical Lutheran Church (3040 North 7th Avenue) has been a neighborhood presence since its first parish hall was constructed in 1947. As the neighborhood grew in popularity and size, the congregation expanded into a complex of buildings, including a new sanctuary (1960) and parsonage (1970). Its existing buildings have been expanded over time. A fence wall was constructed in the mid-1980s to formally enclose the church complex. The second, Temple Beth Israel (3310 North 10th Avenue) was constructed in 1948-49 with concrete block. An adjacent classroom building was constructed in 1959. Temple Beth Israel was later purchased by Phoenix College and modified for educational purposes. The third religious complex, College Park Baptist Church (1333-1349 West Osborn Road), was constructed of concrete block in 1954. The congregation had first constructed a church in 1947, but it was since demolished. A parsonage was likely built concurrent with the first church and is extant. By 1949, they were joined by H. L. Thomas (2917 North 9th Avenue), an agricultural economist with the United States Bureau of Reclamation, W. J. Miller (934 West Campus Drive), an accountant for Del Webb Construction, W. W. Kyle (907 West Catalina Drive), an assistant manager, salesman W. F. Samuels (929 West Catalina Drive), physician Jeffery Millar (1340 West Mulberry Street), rancher L. J. Tustin (845 West Earll Drive), and E. . G. Clemens (1302 West Flower Street), with the Arizona Home Improvement Company. From their occupations, the district apparently attracted middle- and upper-middle class families. A random sample of 16 residents that year showed 100% home ownership (Phoenix City Directory. 1949). Little changed in the demographic makeup in the following years. In 1953, when the district was largely built out, the neighborhood saw a mixture of teachers, students, salesmen, managers, business owners, and professionals. Educators included E. M. Andres (3013 North 9th Avenue) and Emanuel Smith (1007 West Flower Street), both teachers at Phoenix College, and Virginia Tufte (917 West Avalon Drive), a teacher at West Phoenix High School. J. J. Ehrhard (2917 North 9th Avenue), was a student and M. A. Boninger (906 West Campus Drive), was the youth director for the First Baptist Church. Business owners included L. W. Jackson (3327 North 15th Avenue), co-owner of Jackson-Benton Sales Company, R. J. Schubert (933 West Avalon Drive), of Schubert Liquor Company, and K. A. Sadick (1255 West Osborn Road) of the Kenneth A. Sadick Insurance Agency. Home ownership remained high; 23 of 27 randomly selected homes were owner-occupied (Phoenix City Directory, 1953). By 1957, the district was entirely built out with single-family houses, duplexes, and several churches, including Temple Beth Israel. Home ownership was almost universal throughout the district which remained largely middle- and upper-middle class in character. Several residents had risen in their professions including Willett Munsil (3331 North 10th Avenue), president of Munsil Brothers Builders, Augusta Martin (3332 North 11th Avenue), the Deputy County Treasurer, C. E. Haley (917 West Avalon Drive), chief engineer with the City Traffic Engineering Division, Albert Plotkin (930 West Catalina Drive), Rabbi, Temple Beth Israel, and A. E. Banks (917 West Verde Lane), president of Associated Dairy Products (Phoenix City Directory, 1957). From the earliest construction in 1940, through the historic period ending in 1963, the Campus Vista Historic District was largely occupied by middle- and upper-middle class families, many of whom worked in education, medicine, and management. An unusually high degree of home ownership throughout the period is indicative of the district’s stability and value. One of the district’s residents, Cliff Wharton (931 West Verde Lane), is noteworthy as the first African-American United States ambassador and the first African-American Foreign Service Officer to be chief of the United States diplomatic mission. Welcome to historicphoenix.com, your #1 internet resource for buying and selling historic Campus Vista real estate. On this site, you will be able to find nearby school information, restaurants and grocery stores, buyer resources, seller resources, and search all Campus Vista homes for sale. Our goal is to provide you with the most valuable information and service regarding historic Campus Vista real estate and homes for sale. Through this site, we provide you with access to MLS listings and resources for buying and selling a home, but most of all, an easy way to access expert guidance as your time to buy or sell Campus Vista real estate approaches. In today's real estate market, it takes more effort, time, and resources to sell your Campus Vista home. We are personally committed and passionate not only about selling your home, but selling it for maximum market value. We offer our clients a full line of services and a network of service providers to not only provide you with maximum market exposure through our extensive and aggressive marketing plan, but to provide a tailor-made solution to handle all aspects of your real estate transaction including pre-listing preparation to best showcase your home. We also work with an extended list of service providers who can help meet all your needs related to the sale of your Campus Vista home. Find out what your historic Campus Vista home is worth TODAY. For most people, purchasing a home is the single largest and most exciting financial decision they can make. That is why we take finding a home for our clients very seriously. We're not only committed to finding you a home, but to finding you the absolute best home on the market at the best possible price, and if one does not exist on the market, we'll search off-market properties and do our very best to find you the right Campus Vista historic home. This website also serves as a tool for clients to search properties currently on the market, receive up to the minute market updates through email, and even request showings. Start searching now OR let us do it for you!